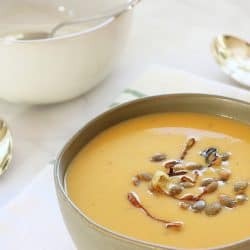 This Butternut Squash and Green Apple Soup has the most delicious blend of flavors from a bit of sherry and tarragon. It’s a dinner party soup that also hits the spot on a cold winter night when you want something rich, creamy and comforting. I haven’t posted a recipe for the Recipe ReDux in a while because – I honestly forgot about it the past 2 months 🙁 My bad. I guess Thanksgiving and Christmas got the best of me and my time. So, I’m happy to be back, and I definitely couldn’t miss this one, because for January’s theme, they asked us to share a healthy recipe using our favorite cooking tool. I have a lot of favorite cooking tools, so it was hard to decide. One of my all-time favorites is probably my immersion blender. It retails for less than $30, and the one that I still use is 27 years old. I know this because I got it when I was pregnant with my daughter and I was convinced that I was gonna be mamma of the year, and make my own baby food. That lasted about 2 weeks, but I’ve used that immersion blender for everything from smoothies to whipped cream and sauces to every kind of creamy soup under the stars, for the past 27 years. 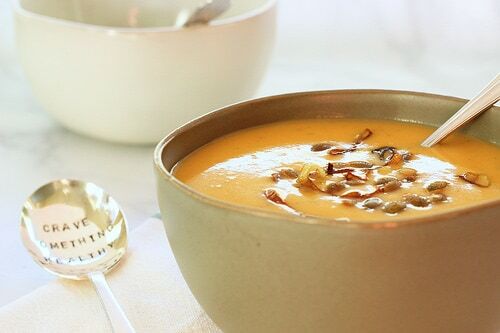 Including this Butternut Squash and Green Apple Soup. This is “dinner party soup”. The kind of first-course you serve at a dinner party when you want to wow your guests – because the flavors are just so fabulous. The first time I had it was probably 15 years ago. I used to live in a wonderful neighborhood where we had “Dinner Group” a few times each year. Neighbors each assigned a dish from a planned menu, to make and share. We all got a little dressed up, and brought our dish over to the host’s home, ate a lovely dinner with drinks and dessert, and then we split the cost across the group. This soup was part of a fall menu, and I still make it all the time. It’s very delicious when I want something creamy, rich and comforting, AND although it’s a rich carb-fest, it’s also jam-packed with beta-carotene – so you don’t have to feel the least bit guilty about those carbs. Here’s a tip: If fresh butternut squash isn’t available, or if you don’t feel like peeling it – use the frozen kind! If you’re not familiar with how an immersion blender works – you literally just stick it in the pot, press the button, and stir it around. It blends the soup without any work or mess at all. You can totally blend it in a blender, but do it in batches and make sure you don’t fill the blender too full. I made that mistake BEFORE I had my immersion blender, and take my word – hot soup WILL explode in a full blender. Heat 2 tablespoons of the oil in a stockpot over medium-high heat. Saute squash, apples, onions, and bread with olive oil. Add chicken stock, tarragon, salt, pepper, and bring to a boil. Reduce the heat to low, cover and simmer until squash and apples are tender - about 50 minutes. 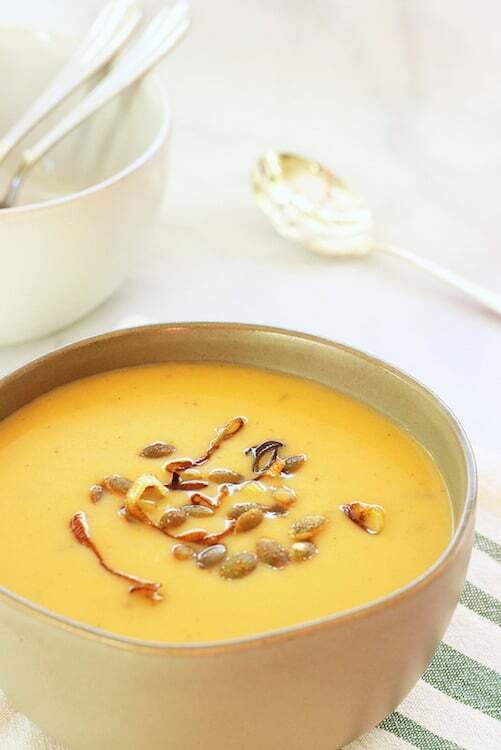 When the apples and squash are tender, puree soup using an immersion blender. Add cream and sherry to soup and bring to a simmer. If garnishing with fried leeks, saute the leek rounds in about 1 tablespoon olive oil, for about 5 minutes, or until they just start to turn golden. 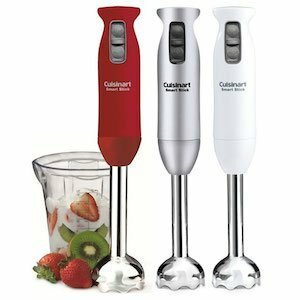 Do you own an immersion blender? What’s your favorite kitchen tool? Please stop by the Recipe ReDux round up to see what kitchen tools our other members couldn’t live without!